Check out 'Let's take a closer look...' for an analysis of some recently played hands. Click to access CBAI Western Region website which includes calendar and results of Western Region Competitions and other related information. I have added a menu entry (see above) 'Laws and Ethics of Duplicate Bridge' which includes a link to the complete text of 'Laws of Duplicate Bridge 2007' as well as examples of Appeals which include several dealing with incidents involving 'hesitations'. And there is also a short article, 'New Laws of Duplicate Bridge 2007 - what players need to know', written by Ireland's leading Tournament Director, Fearghal O'Boyle. Welcome to the website of the Tribes Bridge Club in Galway, the capital of the West of Ireland. The club meets every Thursday in the Galway Bridge Centre which is located on St. Mary's Road. The regular club game consists of Duplicate Pairs with a start time of 7.30pm. The game usually finishes circa 11.00pm. The playing year runs from early October to mid-May. A summer club operates during the period May to September. Visitors are always welcome and with adequate notice a partner can be found. The club also welcomes new members. Please contact the Secretary for further information should you be interested in joining. The Galway Bridge Centre features a bar which also serves tea/coffee. And free car parking is also available. Members of the Tribes Bridge Club were to the fore at the recent IBU Seniors Congress held at the Cavan Crystal Hotel earlier this week. Eddie Fitzgerald, in partnership with regular partner, and former Tribes Bridge Club member, Michael MacDonagh, finished 2nd in the Gala Pairs. Colette Mulhern & May O'Sullivan finished 8th and Deirdre Quin & Liam Faherty finished in the top quarter of the 84 pair field. In the IBU Senior Pairs, Colette & May finished in 3rd place with Eddie Fitzgrald & Michael MacDonagh in 7th place. Deirdre & Liam finished in the top-half of the 80 pair field. In the T/4, which featured 37 teams, Enda Glynn travelled all the way from Lahinch and partnered Limerick's Bob Pattinson and team-mates Joan Kenny & Teresa Rigney (Dublin) to victory after seven rouds of six-board matches. The quartet of Colette, May, Deirdre, Liam finished down the field. passed away on the 7th January 2019 at the ripe old age of 92. In her last few years as a member she played regularly with Irene Wall. The 2nd (and final) weekend of the Camrose Trophy / Home Internationals will take place this weekened commecning on Friday (1st March) evening at 19:00. The following links may prove helpful to those that wish to follow the progress of this competition, in particular given that two Tribes Bridge Club members are included in the Irish team, i.e. Enda Glynn & David Walsh. Link to English Bridge Union which is hosting the 2nd weekend. This page includes a schedule of matches for the weekend. Link to Welsh Bridge Union which hosted the 1st weekend. This includes detailed results from the 1st weekend. N.B. YOU WILL NEED TO JOIN/REGISTER AS A MEMBER (FREE) BEFORE YOU CAN ACCESS THE VUGRAPH OPTION TO WATCH MATCHES. Good Luck to Ireland and best wishes to Enda & David. It is with much sadness that we advise members of the passing of Bridie Kenny. Bridie was a member of long-standing and was elecetd as President for the 1982-1983 season..
Bridie was a competent player and won five Major Club Championships spanning the period 1975 - 2017. She won the Club T/4 with her then regular partner Catherine Kelly in partnership with Vi Cunningham & Bridie Kilagrriff. In the 1986-1987 season she won the Geraldine O'Flynn T/4 with Catherine and team-mates Maura O'Farrell & Enda Glynn. Thirty years later she again won the Geraldine O'Flynn T/4 this time with then regular partner Liam Hanratty and team-mates Colette Mulhern and Maria O'Shaughnessy. She also won the Mulhern Trophy with Liam Hanratty in the 2007-2008 season. Bridie & Liam also won the Corn na dTreabh Pairs Championship (Handicap) in 2016-2017..
Bridie was an active supporter of the club and always had a ready smile, a cheerful greeting, and a devil-may-care attitude. She was down to earth and with her the glass was always half-full and never half-empty. And if you had the good fortune to share her company, even for the briefest of time, you were sure to be in better form on taking leave of her than prior to joining her! Congratulations and best wishes to Roddy Wyer, incoming President of the Tribes Bridge Club for the 2018-19 season. Click link below to view results. 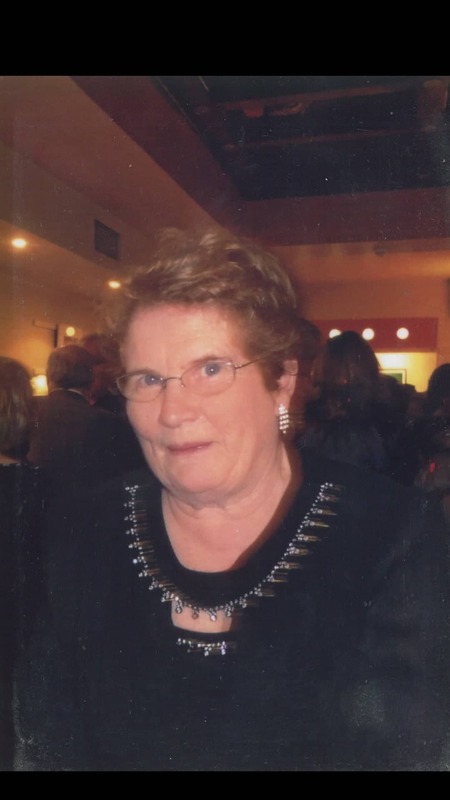 It is with much sadness that we report the recent passing of Phyllis Byrne. Phyllis was a founder member of the Tribes Bridge Club and was elected to the position of Masterpoints Seretary at the inaugural meeting held on 7th January 1971. At the AGM held on the 11th November 1971 Phyllis was elected as Vice-President. In the following year she was duly elected as President of the Tribes Bridge Club. During her time as a member she won Major Club Championships on five occasiosn. Her first win of a Major Club Competition was the Ryder Cup which she won in the 1974-75 season in partnership with Bill Keane. In the 1990-91 season she powered to victory in the Mulhern Cup with partner Mary Rabbitte. She won the Club T/4 on three occasions (2005-05, 2005-06, 2008-09) with partner Malcolm Ryder and team-mates Maurice Hession & Rory Timlin. (Peacefully) in her 94th year, beloved wife of the late Major General Dermot and much loved mother of Jim, Deirdre, Nicky and the late Vinny. Sadly missed by her sons and daughter, daughters-in-law, grandchildren, great-grandchildren, extended family, neighbours and friends. Reposing at the O' Flaherty Funeral Parlour, Munster Avenue, Galway on Monday 21st January from 4.00 p.m. with Removal at 6.00 p.m. to Christ the King Church, Salthill. Funeral after 11.00 a.m. Requiem Mass on Tuesday 22nd January to Rahoon Cemetery. Family flowers only. Donations if desired to the Stroke Unit, University Hospital Galway. House Private. Rory Timlin has very kindly offered to submit occasional articles for posting on the Tribes Bridge Club website. The articles can be found via the 'Rory's Corner' entry on the Main Menu of the Home Page. Rory is a regular contributor to the Irish Bridge Journal and his articles are always instructive and the result of keen analysis. Several current and former members of the Tribes Bridge Club helped Connacht to what looked at one stage like a most improbable win in the recent IBU Inter-Provincial Teams Championship (Open Series). At the end of play on Saturday Munster were on 235.29VPs whilest Conancht were in 2nd place on 196.43VPs. On Sunday afternoon, at the end of Round 8 of 9, Munster were on 288.97 and Connacht were snapping at their heels with a score of 283.27. After the 9th Round, which featured direct matches between Connacht and Munster, the final scoreboard read: Conancht 316.80 with Munster in 2nd place on 315.44.
and to Maurice Hession & Rory Timlin, winners of the Mulhern Trophy. It is with much sadness that we advise members of the passing of Mark Kllilea, husband of Tribes Bridge Club member Anne Killilea. Mark; (retired public representative). Predeceased by his beloved son, Mark. Peacefully at home surrounded by his family. Much adored and loved husband of Anne and cherished Dad to Eidín, Niamh, Deirbrin, Niall, Donagh, Medbh and Eimhín. Sadly missed by his wife and family, his sister's Bid and Vera, his brothers-in-law, sisters-in-law, sons-in-law Ciaran and Kevin, daughters-in-law Tara, Anna and Ailish and adored grandchildren Aoibhin, Daire, Shane, Daithí, Lynn, Giolliosa, James, Oisin, Alibhe, Diurmuid and Tess his many great neighbours, loyal friends and relatives. Predeceased by his sister Marie, and brothers Padraig and Jarlath. Former member of Galway County Council, Seanad Eireann, Dail Eireann and The European Parliament. Reposing at his home on Wednesday from 4 o’c until 8 o’c. Removal to Sacred Heart Church, Belclare on Thursday for Requiem Mass at 12 noon. Burial afterwards in Claretuam Cemetery. House strictly private on Thursday morning. Family request no flowers. Donations, if desired, to Tuam Cancer Care or the Hospice Home Care Team. The above represents the scores entered for board # 17 recently. THREE North/South pairs entered an incorrect contract and THREE East/West pairs failed to spot the error. Note that in this case the error (entering 4♥ instead of 4♠) did not cause a problem with the scoring of the board. HOWEVER, if 4♦ had been entered instead of 4♥ or 4♣ instead of 4♠ then a major discrepancy would have occurred and one pair would have suffered a big loss in their overall score and the other pair would have gained. Remember, as with all computers GIGO always applies, i.e Garbage In, Garbage Out. Computers can only process what is input. So, let us all be vigilant. North/South in terms of what is originally entered into the Bridgemate and East/West in ensuring that what is entered is correct. If the score is incorrectly entered then please call the Bridgemate operator who will correct the error. Checking scores when entering results into the Bridgemates! Remember that East/West are responsible for checking the score that is input by North. The culpability for incorrectly entered scores does NOT rest solely with North! In this case N/S suffered a loss of 5 points and E/W gained 5. But it could have been more significant. So N/S, please be vigilant when entering scores via the Bridgemates...and E/W be even more vigilant when checking them. And the following was another error on the same night! Note that in both of these examples the error was not about recording the wrong contract but rather recording the wrong declarer!